Despite this, the Green Party continues to hold the lead it gained in the first week, taking 35% of the vote this week. This result, its second lowest since the start of the poll, can be attributed to the large boost in the Labour support, who jumped 15% to gain 29% of this week’s poll. Meanwhile, the Conservative Party’s support remains steady at around the 30% mark, for another week. UKIP’s share of the vote dropped to 0% this week, whilst the Liberal Democrats remained at 2%, at the same mark as the ‘Other’ vote. Encouragingly, the ‘Don’t Know/Won’t Vote’ option returned a 0% result once again. A total of 52 students participated in our poll this week; this is probably due to our reduction in the poll’s promotion this week. We’d really encourage you to take part in the poll when it opens on Monday, even if it is just a little bit of fun! If you’ve got an idea about who you plan on voting for, or even if you don’t, make sure you vote for that choice between 00:00 on Monday and 23:59 on Friday! With the Challenger’s debate this week – which included the Labour Party, the Green Party of England and Wales, Plaid Cymru, the Scottish National Party, and UKIP – we are likely to see the results of the debate in the upcoming poll. 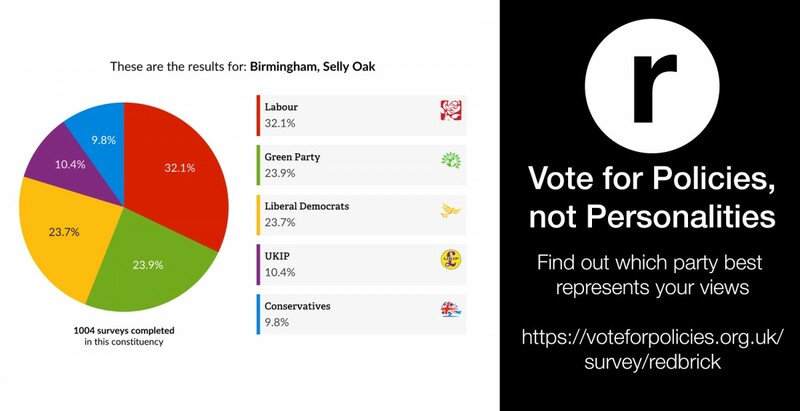 Similarly, with over 150 people having taken part in our Vote for Policies survey, the poll results may fluctuate as people choose the party based on those results.